These are the new Crystal Palace shirts 2016/17, Palace’s new strips for the upcoming Premier League season. 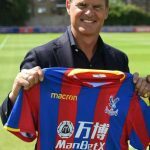 Made by technical partners Macron, the new CPFC kits were officially unveiled at the club’s end of the season awards night on 12 May, 2016. 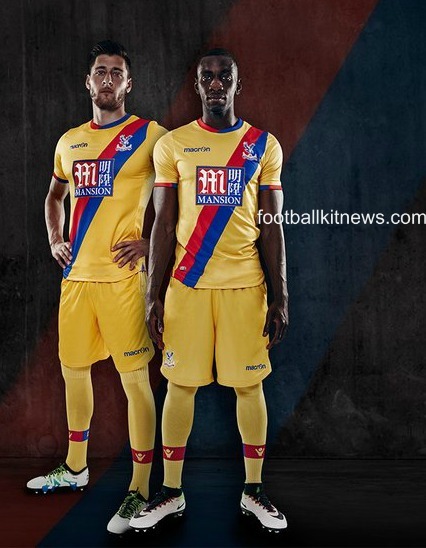 Palace’s new away kit will be gold in colour and features a blue and red sash. The Eagles had a sash when they briefly topped the erstwhile First Division back in 1979 after winning promotion to the top flight from the Second Division. The Mansion Group continue their sponsorship of both Palace tops, as can be seen in the pics below. This entry was posted in English Premier League and tagged Macron on May 13, 2016 by Football Kit News. Puncheon’s face says it all. Away kit is ok, but can’t make up for the disaster that the home kit is. They look more and more like Steaua Bucharest every year. Way too much blue – go back to 1990 colours, I reckon! I Think they both look amazing only one that is better is the 13/14 away kit. Crap first team shirt. Far too much blue and no yellow. Away top looks OK.
Isn’t the home shirt the Macron Villa kit from two years ago? Has a Palace fan I hate the home kit it’s just not Palace, last night Palace social media went in melt down with how bad the home kit is, it is has bad has the 1999 all red adidas kit, the home shirt just won’t sell but I do like the away shirt. Yikes. Worst Palace kit ever. Whoever is making decisions on these things has no sense of what constitutes good design. Horrible. Shocking from Macron. They have been doing really well recently and then come out with whatever this is. How does the club even approve of this design? I don’t see Palace at all when i look at that home kit. Away kit is fine, though would have gone for a slightly brighter yellow. I’m in the minority clearly, but i really like it. Bold, strong design, complements placement of badges and sponsors. 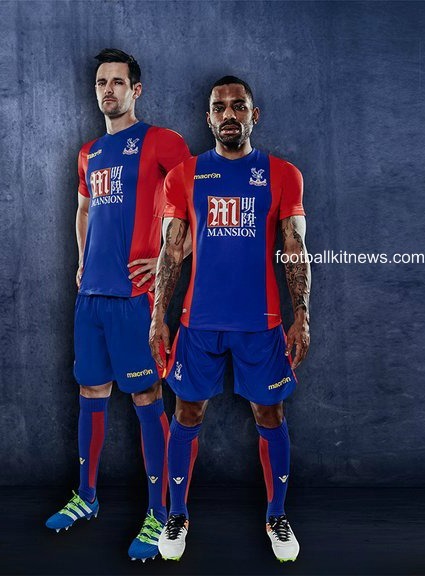 Palace have had some terrible kits over the years, but this is not one of them. It may even be the best they’ve ever had. both kits are fantastic. The home is one of the best I have ever seen. The away one is great too. Not a fan of this stripe either, away kit for me looks fine. Like the away kit. Home kit is Okish. I think the Home kit looks alright but as always there is only so much you can do with a football kit that has stripes. Away kit looks decent. 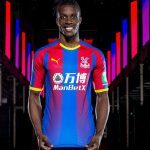 I know it’s all about money but Crystal Palace had a really nice Home and Away kit this season in my opinion and it would be nice to see Clubs keep their kits for 2 seasons rather than 1. Agree with those who think the home kit isn’t really “Palace”, but it’s not awful. I think the away kit is really quite nice, though I think all-white with the sash looks even better. Bad photoshopping, the guys in the foreground of both images are standing on the other guys’ feet. The home shirt is just meaningless, one of the most boring in our history. At home we need multiple stripes or a sash over white because that’s our identity ! The away, I’m quite impressed with really… its different combining our lucky yellow with a sash. Also, Macron sizes in general came up smaller than Avec I noted.